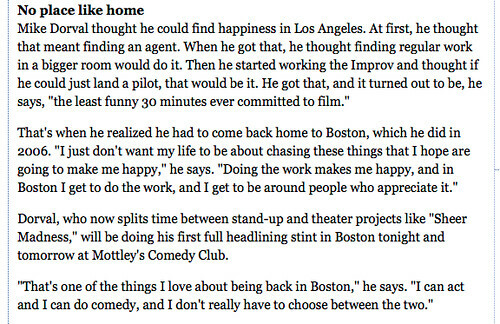 Boston Globe Mentions Show I'm Doing This Weekend With Mike Dorval, originally uploaded by baratunde. Mike Dorval is a great comic and just an all around great guy. I'm exicted to be performing on his big shows this weekend. Saturday afternoon I'll be talking to comics about marketing and my experience being an all around promotional whore. If you have questions or things you want me to discuss, please post them in the comments.